I love my friend, Julie Bellon. I really do. I met Julie when we lived in the same neighborhood, and really got to know her when she tended my youngest daughter, when I had to go back to work after my divorce. I absolutely trusted her with my child, and that’s saying a lot about what I think of Julie’s character. Julie and I have a lot in common. I’m from the U.S.; she’s Canadian. I have a respectable number of children (4); she has 6 and 7/9ths. My kids are all adults now; she’s having a baby any minute. Julie is kind and patient and a wonderful mother; I’m a little high strung and extremely excitable. In addition to raising her children, Julie teaches journalism for BYU (actually using her college degree), is active in her Church and community, and writes books; I sit around and eat nouggies all day, using my Mensa level IQ to think of ways to get out of work. Julie and I have learned to respect our differences over the years—especially when we start talking about books. I will tell her about a new sci-fi novel that I loved and Julie rolls her eyes and thinks, “Freak.” She’ll tell me about the romance she just read (or wrote), and I mutter, “Pansy,” under my breath. But despite all that, I really do love Julie. So I agreed to review her new book, All’s Fair, and to be part of her blog tour. I called Julie up after I finished her book. Me: So, Julie. You wrote another one of those (cough! ack! ahem!) romances again. I thought you said you were done with that and this one was going to be action/adventure. But no. Not only have you written another romance, but there are actually TWO romances in this book—Kristen and Ryan, and Brandon and Rachel. What’s up with that? Julie: It’s not a romance. It’s romantic suspense. Didn’t you notice all the suspense in there? There are kidnappings by terrorists, bombs and bullets everywhere. Then there’s Homeland Security getting involved, and betrayal, deception and intrigue on every page. Me: Oh, yes. I liked those parts. I liked the sandstorm and the dead bodies. I liked Michael, the evil ex-fiancé and his ex-wife, Madj. I’m thinking maybe they still have a little sumthin-sumthin’ going on. And I liked it when Kristen was kicking Ryan’s behind in the political PR. Hah! Showed him. Julie: What parts didn’t you like, you freak? Me: Well, you know. The kissing and the hand holding, pansy-face. Julie: There are only a couple of kisses in the entire book and they’re at the very end. Geez, what is your problem? Julie: Oh, grow up! So how badly did you want to poke your eyes out with a fork when you were reading my book? Me: It really wasn’t that bad. I read it in an afternoon. I was going to call you right away, but I had to go to the doctor. Can you help me put these eye drops in? Julie: Fine. Was there anything else you liked about the book? Me: Well, if I were willing to admit to liking romantic suspense, I’d probably say I liked this one. I would say that I liked that it’s set in Iraq and has a strong supportive statement of our troops. I would say I liked that Kristen and Rachel, the two female characters, are strong, independent, professional women. I would say that I was really impressed that Rachel wasn’t a total wuss, even when she got shot. And I would say that I loved your opening scene when Kristen got caught in the rain in her wedding dress, then meets up with Ryan and she’s drenched and muddy and practically hypothermic and she has to go to his cabin and wear his ex-wife’s pajamas. Hah! But since I will never admit to liking anything to do with romance, I can’t really say those things. Because I’m not a wimpy, cry-baby, pansy-face. Julie: I don’t know why I even bothered giving you my book to review. I knew it was going to be like this. Do you have any serious questions you want to ask me? Me: Yes. When are you ever going to name a character after me? Julie: Actually, I’ve modeled a character after you in the book I’m working on right now. She’s an evil spy who pretends to be a double-agent for the U.S., while pretending to work for a group in Russia who are trying to reconsolidate the Soviet Union, all the while she’s actually part of a secret organization whose sole goal is to find an ancient artifact that will allow them to manipulate the magnetic forces of the earth to cause earthquakes of staggering magnitudes anywhere in the world, and they plan to thereby assume control of all the current political structures by threatening devastation by earthquake if they don’t cooperate. Her boyfriend betrays her in the end and she dies a very long and gruesome and agonizing death. Me: Ooh, cool! Finally a plot I can really get into. When does that one come out? 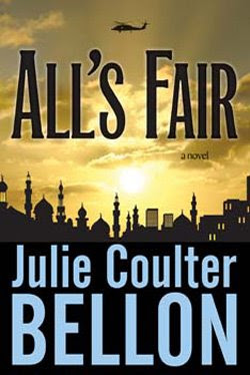 You can purchase a copy of Julie Coulter Bellon’s book, All’s Fair, here. 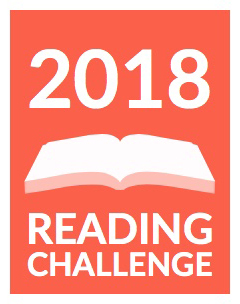 To read more about Julie and her other books, to read a sample chapter of All’s Fair, or to participate in Julie’s charity drive to send Care Packages to our troops in Iraq, visit her website here. If you’re in the vicinity of Salt Lake City, Utah, you can catch Julie on Good Things Utah on Monday morning, July 14th, at 10:00 a.m. on Channel 4 (ABC). I’ve got my TIVO set already! 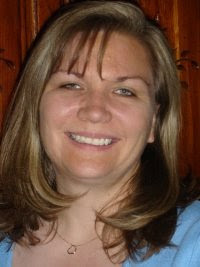 Julie is the author of nine suspense novels, including All Fall Down, winner of the RONE award for Best Suspense/Thriller. She is the mother of eight children and when she’s not busy being a mom or a writer, you will find her browsing through bookstores to add to her book collection. i loved your interview…it made me laugh. what a wonderful relationship you two have. Great interview and I am looking forward to a book with a character based on you! Too funny! And it sounds like a great book. Fun review, by the way! Sorry, no relation to Robison “Popcorn” Wells, although Wells is my maiden name. The two of you have a very strange friendship . . .
Can’t wait to read this book. You have the funniest interviews. And I have to confess, I’m glad Julie puts in romance. Hilarious, Karlene. Makes me want to read more from you—and Julie’s book as well 🙂 Of course I’ll hurry through the suspense so I can get to the kissing. LOVE the review, met Julie – loved her, read the book – loved it! …I guess I’m a wuss too. That was a very funny interview. And I still really want to read the book.